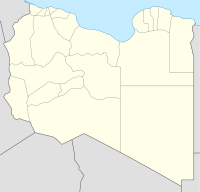 RAF Gambut (or RAF Kambut) is a complex of six abandoned military airfields in Libya, located about 5 kilometres (3 mi) north-northeast of the village of Kambut, and 50 kilometres (31 mi) east-south-east of Tobruk. During World War II, the complex was an important facility, used by the Royal Air Force and a large number of RAF squadrons were based there for a time. Gambiut was an airfield of Regia Aeronautica. Axis forces captured Gambut on 17 June 1941, after the Battle of Tobruk. This was a significant blow to the Allies as the airfield had been used to provide air-support to the Allied forces besieged at Tobruk. The airfield saw use by the German Luftwaffe until its recapture by the New Zealand 4th Infantry Brigade on 25 November. Today the remains of the airfields – deteriorating under the desert sands – are visible on aerial photographs. ^ Mitcham, Samuel W. (2007). Rommel's Desert War: The Life and Death of the Afrika Korps. Stackpole Books. p. 81. ISBN 0811734137. ^ Mitcham, Samuel W. (2007). Rommel's Desert Commanders: The Men Who Served the Desert Fox, North Africa, 1941–1942. Greenwood Publishing Group. p. 101. ISBN 0275994368. ^ "RAF Gambut". Air of Authority - A History of RAF Organisation. Retrieved 30 March 2015. ^ Maurer, Maurer, ed. (1983) . Air Force Combat Units of World War II (PDF) (repr. ed.). Washington, DC: Office of Air Force History. pp. 160–162. ISBN 0-912799-02-1. LCCN 61060979. Maurer, Maurer, ed. (1983) . Air Force Combat Units of World War II (PDF) (repr. ed.). Washington, DC: Office of Air Force History. ISBN 0-912799-02-1. LCCN 61060979. Maurer, Maurer, ed. (1982) . Combat Squadrons of the Air Force, World War II (PDF) (repr. ed.). Washington, DC: Office of Air Force History. ISBN 0-405-12194-6. LCCN 70605402. OCLC 72556. Wikimedia Commons has media related to RAF Gambut.